I've been posting on an irregular basis recently due to the need to keep giving my eyes a lengthy rest because I'm at the "inbetween stage" with respect to my surgery for cataracts. My left eye was operated on three weeks ago and at present I've not got any glasses which work properly for both eyes - hence the need to remove them for long periods and NOT stare at a screen - even with enlarged text! My second "phacoemulsification of cataract with intraocular lens implantation" - this time on my right eye - takes place at Moorfields Eye Hospital this afternoon (fingers crossed and touching wood!). Happily I will be 'asleep' at the time. This means blogging will continue to be patchy until I'm back to 'normal vision'. I have to wait six weeks for both new lenses to "bed in" before I can get new prescription glasses for reading and computer work in early July. Until then I'm hoping my existing glasses will work better once both eyes have the same sort of lens - but I may find I still can't stare at the screen for long. The huge plus point so far is it has been absolutely brilliant to be able to see artwork properly again with my left eye. 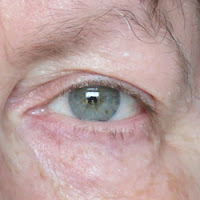 I'm really looking forward to going to exhibitions and having two new bionic eyes which see proper colour and tone! PS The good news is I'm getting much better at the eye drops routine - so long as I can lie down! PPS I'm off to hospital in less than an hour so the review of the Rory McEwen exhibition will have to wait until I get back. Good news Katherine, that you will be able to see artwork properly again. Imagine the artists from history who would have benefited from this surgery and how that would have affected their work and art history had it been possible 50 or more years ago. the close-up of your left eye. I hope all goes well with the second eye, Katherine. Three years after my own implants, I still wake up each morning thinking how wonderful it is to be able to see clearly and to be able to draw and paint without difficulty! I've just taken my eye shield off and it's fabulous. Apart from some quite bad inflammation on one side which explains all the extra drugs I've come home with. Apart from the bits where I notice I missed a few bit when doing the cleaning - quel horreur! Reminds me of my mother who could never see the bits on the carpet until she had her cataracts done. It is funny how we see our parents with clearer eyes as we age ourselves..no puns intended here, and I am so happy for you that there are surgeries out there to correct your eyes! I agree with David, imagine if artists from the past had the ability to correct their vision...ahh, can't help but wonder at that. Wishing you a speedy recovery and amazing vision that will make it all worthwhile. So pleased all went well. Take care.